Do After-Market Exhaust Systems Really Work? 98% of new vehicles come with exhaust systems that are fairly restrictive. Unless you’ve purchased a dedicated sports car like a Corvette, Porsche, or Ferrari, the auto manfacturer has sold you a car with a limited exhaust system. 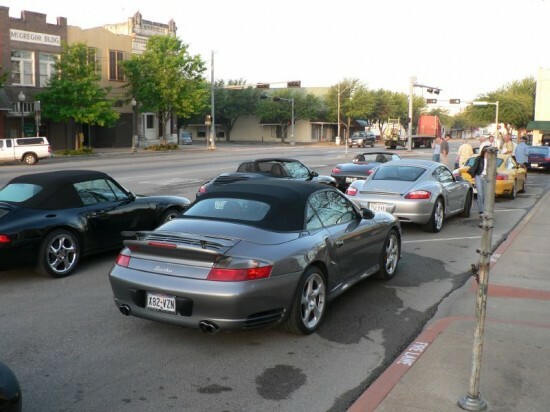 Are you driving a dedicated sportscar? No? Then your exhaust system is probably restrictive. Image copyright John Perser. Why do manufacturers do this? Because restrictive exhausts are quiet and inexpensive. Automakers strive to make a great product, but they often cut corners in places where most consumers will never notice. The factory exhaust system is one of these places. Borla exhaust systems, for example, use 201 or 304 series stainless steel for pipes and mufflers which is thicker, stronger, and more resistant to corrosion than just about any factory exhaust system. Thicker and stronger steel also doesn’t resonate as easily, which reduces noise and eliminates “drone” without impacting performance. Flowmaster and Magnaflow use upgraded materials in their mufflers that improve sound-deadening without resorting to restrictive exhaust path designs like most factory mufflers. In many ways, the modern engine is really just a big pump. You put air and fuel in, and you get exhaust and horsepower out. The more air and fuel you can put it, the more horsepower you’ll have. Therefore, if you make your exhaust system flow better, your “pump” can work better. However, there is a catch – larger systems aren’t always better. See After-Market Exhausts Can Disrupt Your Car’s Power Curve for more info. The cheapest and easiest way to make an exhaust system quiet is to completely disrupt the flow of exhaust gases. 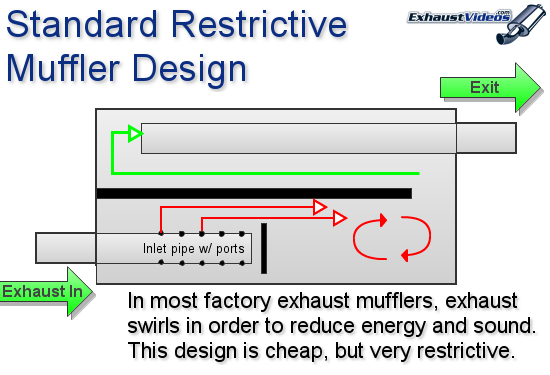 Most factory mufflers use a very basic design that essentially forces all the exhaust gases to find their own way out – sort of like stuffing an ice cream cone until something breaks. The type of design illustrated above is the cheapest, easiest, and most common way to make an exhaust system quiet. Of course, disrupting exhaust gas so dramatically causes a flow restriction. Because a lot of new car customers don’t want a car with a loud exhaust, most new cars come with this type of setup. When you go with an after-market system, you get more noise, but you also get more power. I think of my 2011 5.7L HEMI Charger as a performance car , however, the dual exhaust system sounds very quiet. Can I improve performance significantly by adding a Flowmaster system. Why not from the exhaust pipes back rather than the cat back? Tom – You won’t see a significant performance increase – 3% is about all you’ll ever get from an exhaust upgrade. Still, for a vehicle like yours, that could be another 10-12 hp. As for adding a system vs. just adding some new mufflers, the cat-back systems add more power. Flowmaster, Magnaflow, Borla, etc. all tune the cat-back system to provide a little more power, whereas a muffler is probably just going to add a little more noise. Finally, after-market exhausts work best when they’re paired with intakes, customer tuners, etc. If you’re really looking for more power, I’d suggest planning for all these upgrades. If you’re just looking for more sound (and I don’t blame you if that’s the case), a good set of mufflers will work just fine. Jason – That’s good info. I do have a K&N intake but that’s it. I’ll have to think about the expense of a tune. Thanks very much for your help. Hi. I’m asking about my 2007 5.3 liter vortec v8 flexfuel engine in my Chevy. I was curious if replacing my muffler with straight pipe or flex pipe, same size pipe as stock 3″. Would removing my muffler affect the flex fuel system at all? Also would it give me any sort of advantages besides the sound of my truck? Anthony – Mufflers don’t really impact performance on newer vehicles. If you replace the muffler with a straight pipe – and don’t make any other changes to the vehicle – it’s unlikely anything will change. You’d see a slight increase in performance, perhaps a slight increase in fuel economy. You might also see a slight loss of low-end torque, as removing the muffler can cause an increase in backpressure at lower RPMs. I was just curious if my setup would work correctly. On my ’05 Pontiac Bonneville SE with a base of 205hp, I was thinking of installing a ZZP 3″(all they offer)H-body downpipe, ZZP resonator(2.5″ in/out), MagnaFlow 2.5″ Y-pipe into a X-pipe, then 2.5″ 16ga. pipe into two 11226 magnaflow mufflers. I’m using a 2.5″in/3.5″out short tip. I’m going to have around 300hp when all is said and done with small engine mods here and there. Travis – Sounds big, but if you’re going to add 100hp, you’re probably doing forced induction, in which case it doesn’t matter too much. But if you’re adding 100hp via motor modifications or some sort of combination of bolt-ons, a) I’m going to say you’re being optimistic and b) you might run your plan by the local dyno tuning shop first. Few years back, I had to replace the original exhaust system from the cat back that lasted 150k miles, have replaced it twice with Walker Quiet Flow exhaust system. Ever since I replaced the original with Walker, car never seem to perform the same, had vibration, seemed that there was less hp, much louder than the original, even with the Walker Quiet Flow. I notice that the exhaust was much hotter than the original, a lot of popping and cracking after turning off the car. Now the system needs replaced again, 4th exhaust system @250k, so this time I bought the original Toyota muffler. The original is a much bigger muffler than the Walker and the original is 2 1/2″ pipe compared to the Walker that is 2 1/4″ pipe. Plus the Toyota original has a vibration dampener on it. So my question is, based on the issues that Ive explain of having with the Walker muffler system, is it some what to do with the pipe size from the cat back, creating a bottle neck in the system. Stated on this site, that car manufactures go cheap on exhaust systems, wouldn’t it be cheaper to go with a smaller pipe diameter than a larger one. If after market companies are going to make OEM parts, shouldn’t they make them the same size pipe. Now we all know that car manufactures have to test there exhaust systems before selling a car, but do after-market companies have to do the same, I was told not when talking to Walker Corporation. They say they do the number crunching. Ok, who would better know about the exhaust system on a car than the manufacture themselves. Terry – It’s an interesting story, mostly because I don’t understand how you’d be replacing Walker systems every 25k miles or so. Is it rust? If so, did anyone check to see if your OEM catalytic converter is clogged up? If the OEM exhaust rusted out, I’d guess that OEM cat is clogged…that would explain the issues you’re experiencing. But to your question about factories going cheap, smaller size isn’t always a cost savings. If the supplier that Toyota is working with is offering a better price on a larger muffler – perhaps because they’ve already got tooling to stamp out mufflers in that size – that’s the way Toyota would go. As for after-market companies tuning and testing exhausts, it really depends. A lot of them do, some of them don’t. Some of them do really smart, iterative tuning to develop the perfect configuration (most name brands), and some just throw a muffler on that they know will sound good and don’t worry about it. Walker is owned by Tenneco, which builds OEM exhaust systems alongside the after-market stuff they sell. My guess is that they’re doing a decent job of making sure these things are good. Again, my advice would be to inspect the entire exhaust system. Even a slightly clogged cat would cause problems like you’re describing (as would an aging fuel pump, a PCV system that needs a part, and a few other things). It’s probably not the exhaust that’s the problem, IMHO. blaze – The best suggestion is to get a tuned cat-back exhaust system. There are plenty to choose from – check out the exhaust systems from Gibson (they specialize in Chevy).